Kukup Beach is one of the beach tourism destinations in Jogja or one of the rows of beaches in Gunungkidul which you should visit. 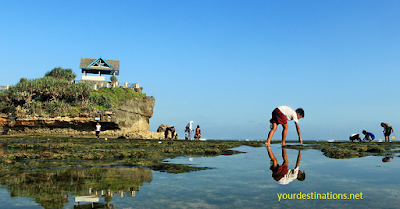 Speaking of the beach tour in jogja for the family, it certainly would not be complete if not talking about the beach kukup Gunungkidul Yogyakarta. Because the beach kukup offers various types of tourist activities for families, including hunting marine biota on the lips Beach. Indeed at this time a lot of beaches - beaches in the area of ​​Gunungkidul which became a domestic tourist talk through various social media. Starting from the beach that there are activities Snorkeling Snorkeling, Or Beach Indrayanti famous for its Resto and cleanliness even Siung Beach with the beauty of the cliff - his cliff. 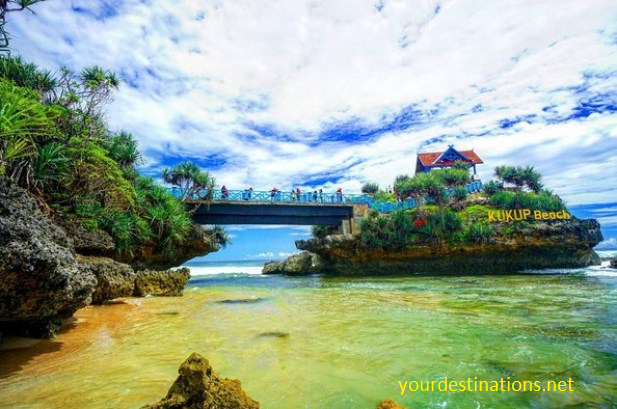 But beach attractions kukup Gunungkidul not less interesting for you to visit with some of the beach benefits. Because beach kukup one of the beaches that we refer to hunt marine life with your family. Certainly very fun if we vacation with family and enjoy together with children. By hunting for marine life, you can also teach your children how the shapes and names of living things that exist in the sea. What is interesting about Kukup Beach? Kukup Beach offers beach tourism destination that has a very interesting sight to visit, this beach is decorated by the bay and small island, small cave, marine biota and white sand typical beach. The marine life on the kukup beach is very diverse and may be very complete compared to other beaches in Gunungkidul. The activity of catching or searching marine biota in kukup beach is very easy, because you just look at the bottom of the beach water in the form of perforated coral. You just buy or rent fishing nets and buckets, as a tool to capture the marine biota. Of course fun, if you are with your family looking for and get a small fish in the hole of the coral. Unfortunately on the beach Kukup not allowed to swim because in this sea, because the waves are large enough for you beginners are not allowed to swim to enjoy sea water kukup beach. To be able to swim at kukup beach is recommended only for professionals only, but still must be extra careful because in this beach there are marine biota sea urchins and sea urchins. Because if you are exposed to thorns of these animals can be very dangerous, which causes swelling, infection, experiencing pain and even cause shortness of breath. Kukup beach also has a small island but more precisely the giant rocks where the place is often used to take photo photos primarily used for pre-wedd photos, and good selfie activities with friends, family, until the couple. You do not have to worry to go to the small island because it has been given road access in the form of a bridge to reach it. Above the giant rocks there are substations to enjoy the atmosphere of the beach from above and the entire coastal scenery quite visible. If the weather is sunny you can enjoy the sunset in the afternoon, a beautiful scenery that will fascinate with its beauty. In addition to the giant rocks, there is also a place that resembles a small cave from the cliffs to the west coast which is managed to be a nice resting place to use as a resting place. Public facilities at this beach is quite complete, ranging from merchant souvenir knick knacks, Restaurants, Parking Lands, Public Toilets, Bathrooms to rinse, Mosque to lodging such as hotels circulating around the beach Kukup easily you can meet. The condition and also the cleanliness of all public facilities in the beach kukup very comfortable, so you do not have to worry with all your needs while in the beach kukup. - Using the West Imogiri line - Jalan Siluk Panggang - up to the cell beach road. Java. This path is a road that goes to the south of downtown Yogyakarta, and alternative roads are closer than other routes with an overall distance of about 59 km with travel time of approximately 1 Hours 35 Minutes. - Using the East Imogiri line - Pathuk Road - Dingo Street - go to the turning intersection right onto the Playen Paliyan street and meet at a fork of roasted silver road and the Sel Sel beach road. Java by going south to find Kukup beach. Overall using this path takes the distance of about 60 km and travel time about 1 Hour 45 Minutes. - Using the National Road III Road to the east then straight up to the T-junction that connects with Wonosari regency, no need to turn left. Keep using the right path. Until entering the street - Playen Paliyan - up to the fork of Siluk Panggang road and Pantai Sel Street. Java. At the overall distance traveled 64 km with time in about 2 hours or less if not jammed. All routes start from downtown Yogyakarta, Malioboro Street. We recommend using a private vehicle to take it because in the fear of using public transport takes longer, if not bring a personal vehicle you can rent vehicles such as cars and motorcycles in the rental. Beach Complete Address: Kemadang Village, Tanjung Sari Sub-district, Gunung Kidul Regency, Yogyakarta, INDONESIA. Quite cheap for the admission price of beach kukup, you just pay 10.000 / orang when passing TPR (Place Levy Retribution) beach area in Gunungkidul. As for the cost of car parking Rp. 5,000 / car, while for parking fee for motor Rp. 2,000. If the next vacation you have not thought about where, you can visit this beach with the family to calm the mind after tired of the daily grind. So the explanation about the beach tourist attractions Kukup Gunungkidul Yogyakarta, hope you with the family can find a fun tourist attraction in Jogja.